For the use of chemicals in agriculture to aid harvesting, see crop desiccation. Canisters are commonly filled with silica gel and other molecular sieves used as desiccant in drug containers to keep contents dry. Although some desiccants are chemically inert, others are extremely reactive and require specialized handling techniques. 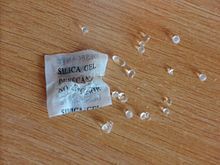 The most common desiccant is silica, an otherwise inert, nontoxic, water-insoluble white solid. Tens of thousands of tons are produced annually for this purpose. Other common desiccants include activated charcoal, calcium sulfate, calcium chloride, and molecular sieves (typically, zeolites). One measure of desiccant efficiency is the ratio (or percentage) of water storable in the desiccant relative to the mass of desiccant. Another measure is the residual relative humidity of the air or other fluid being dried. The performance of any desiccant varies with temperature and both relative humidity and absolute humidity. 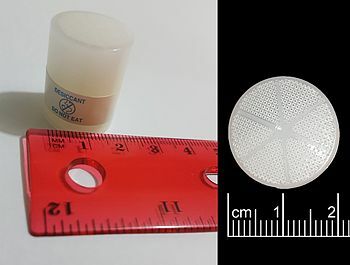 To some extent, desiccant performance can be precisely described, but most commonly, the final choice of which desiccant best suits a given situation, how much of it to use, and in what form, is made based on testing and practical experience. Sometimes a humidity indicator is included in the desiccant to show, by color changes, the degree of water-saturation of the desiccant. One commonly used indicator is cobalt chloride (CoCl2). Anhydrous cobalt chloride is blue. When it bonds with two water molecules, (CoCl2•2H2O), it turns purple. Further hydration results in the pink hexaaquacobalt(II) chloride complex [Co(H2O)6]Cl2. One example of desiccant usage is in the manufacture of insulated windows where zeolite spheroids fill a rectangular spacer tube at the perimeter of the panes of glass. The desiccant helps to prevent the condensation of moisture between the panes. Another use of zeolites is in the dryer component of air conditioning systems to help maintain the efficacy of the refrigerant. Desiccants are also commonly used to protect goods in shipping containers against moisture damage. Hygroscopic cargo, such as cocoa, coffee, and various nuts and grains, are particularly susceptible to mold and rot when exposed to condensation and humidity. Because of this, shippers often take precautionary measures to protect against cargo loss. Desiccants induce dryness in any environment and reduce the amount of moisture present in air. Desiccants come in various forms and have found widespread use in the food, pharmaceuticals, packing, electronics and many manufacturing industries. Air conditioning systems can be made based on desiccants. Desiccants are used in different kinds of livestock farming to dry newborn animals, such as piglets. The use of a good desiccant can help them dry quicker and save energy, which can be crucial for the animal's development. Another use is to reduce bacteria and pathogens that thrive in wet surfaces, reducing bacteria pressure. However, some desiccants have a very high pH-level, which can be harmful for an animal's skin. Toluene is heated under reflux with sodium and benzophenone to produce dry, oxygen-free toluene. The toluene is dry and oxygen free when the intense blue coloration from the benzophenone ketyl radical is observed. Desiccants are also used to remove water from solvents, typically required by chemical reactions that do not tolerate water, e.g., the Grignard reaction. The method generally, though not always, involves mixing the solvent with the solid desiccant. Studies show that molecular sieves are superior as desiccants relative to chemical drying reagents such as sodium-benzophenone. Sieves offer the advantages of being safe in air and recyclable. ^ Otto W. Flörke, et al. "Silica" in Ullmann's Encyclopedia of Industrial Chemistry, 2008, Weinheim: Wiley-VCH, . doi:10.1002/14356007.a23_583.pub3. ^ Daou, K; Wang, Xia (2005). "Desiccant cooling air conditioning: a review". Renewable and Sustainable Energy Reviews. 10 (2): 55–77. doi:10.1016/j.rser.2004.09.010. ^ Chai, Christina Li Lin; Armarego, W. L. F. (2003). Purification of laboratory chemicals. Oxford: Butterworth-Heinemann. ISBN 978-0-7506-7571-0. Lavan, Z.; Jean-Baptiste Monnier & Worek, W. M. (1982). "Second Law Analysis of Desiccant Cooling Systems". Journal of Solar Energy Engineering. 104 (3): 229–236. doi:10.1115/1.3266307. S. Sadik; J. W. White (1982). "True potato seed drying over rice". Potato Research. 25 (3): 269. doi:10.1007/BF02357312.